Steph Curry was drafted into the NBA, in 2009, signing a contract with sports apparel bohemouth Nike. During his initial four years in The Association , he was a terrific player. He however suffered from really bothersome ankle injuries .When he could play the whole basketball world witnessed an amazing extremely gifted shooter with a transcendent game with an down to earth an appealing boy next door personality who was ultimately destined to be an future mega star. Curry’s contract was up for renewal in 2013 with Nike. Sensing an rare opportunity Under Armour, which had been selling basketball shoes for only a few years.Offered curry $4 million a year to switch to their brand . Nike, declined to match the offer and was paying him a reported $2.5 million at the time .That was a mistake The Swoosh lived to regret . In all fairness when basketball shoes sales had been somewhat on the down trend at the time .With Curry in the fold Under Armour’s sales sky rocketed. They were up 95 percent in the fourth quarter of last year (compared with 2014’s fourth quarter) and another 64 percent in the first quarter of this year. Its footwear revenue was $678 million in 2015, up from $127 million in 2010. Although Nike dominates the business of basketball shoes, Under Armour has really announced it self to be a real player in the signature shoe game . 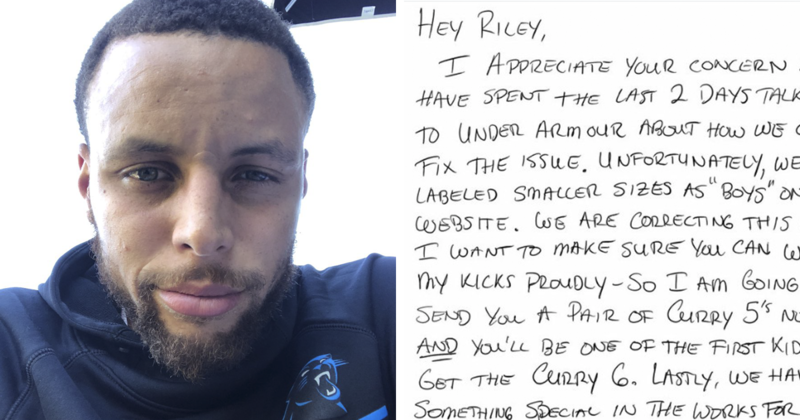 After thinking about the letter he received from a girl who wanted to make his shoes available for girls:Stephen Curry said ‘she opened my eyes’ .The 9 year old Golden State Warriors super fan Riley Morrison, was disappointed to find that Curry’s signature shoes were available in boys styles only . She wrote a letter to Warriors superstar Stephen Curry requesting Under Armour Curry 5 sneakers be made available for girls also. The multiple NBA MVP responded when the letter went viral over the INTERNET. He also made a handwritten letter declaring promising to correct the error and offered Morrison a pair sneakers . Following Curry’s response, the Under Armour website switched up the children’s shoes’ online listing from “Boys” to “Grade School..Stephen Curry has advocated strongly for women equality in life as whole and of course in the game of basketball . The father of two young girls,one of his daughter’s is coincidently named Riley as well.Curry recently wrote an essay about supporting women and the need for pay equity. The NBA mega star showed that he seriously supports gender equality with action rather than lip service. Curry has his own line of adult and kids’ basketball sneakers through Under Armour.The 9 year old potential customer took issue with the fact that the shoes only come in boys’ sizes. She wanted to nab a pair of kicks as she also plays basketball.. Her handwritten letter to the baller expressed disappointment in the most adorable way by a child , it went viral when after her ftaher posted it on IG (Instagram). All excellent points, Riley! The letter made the rounds on the internet and Curry addressed it directly and responded in turn. There was something so personal and powerful about the handwritten letters shared by the two parties involved . It felt so immediate and passionate in a medium that often can often be very jaded. While the exchange was shared with social media, it was a very genuine and commenadable act by Curry to do . It also reminds us that girls play hard and speak with their dollars. The Steph Curry 5s are a cool athletic shoe. They come in many colors and styles and are customizable.They will look good on both male and female basketballers. Clothes and shoes have no inherent gender and this conversation between Curry and Morrison reminds us of that. Curry deserves alot of credit for responding and making change. We as a society cannot stop until full gender equality is achieved. If you consider yourself as a passionate on line shopper like myself,eBay has amazing deals on the best products and exercise equipment . I hoped you enjoyed the Keeping His Promise To A Young Fan-Steph Curry Shoes For Girls article and if you have any questions about the post want to leave a comment or want to leave your own personal review, please leave a comment below thank you. That is a really interesting read. I am also a fan of Steph. He is truly a down-to-earth person even though he is indeed very talented. I actually looking to get a new shoes for my son and I will definitely be considering Under Armour’s Stephen Curry shoes. Thanks for sharing. Hi, Nig You a good looking website here it’s full of useful info and it’s very well put together and also easy to navigate. Hello Dave thank you for reading my blog post. I also appreciated your positive feedback. Again I appreciate your time and honesty have a good week Dave . What a single individual can do to a big-time celebrity and mind you she’s only a girl. I think what made Steph Curry into granting the girl’s request is the personal, direct and sincere letter. She also mentioned Curry’s daughters and that hit the heart of a dad like him. This is a good article, I saw part of this story on the news but didn’t have a look at the letters that Riley and Curry wrote. That girl is courageous and they are making changes. Under Armour has potential to beat out Nike one day. I watched a special on Steph Curry’s shoe deal and Nike didn’t value him enough to change the name on their sales pitch to renew his contract which led him to sign with Under Armour. Nike missed out this one. Great Article! Go Steph and Go Riley!